This article was originally published in the March 21, 1998, issue of America. The current excitement about anything related to the Titanic disaster 86 years ago makes it hard to remember all the way back a year, when savants were saying the Broadway musical of that title “would not last long” and the late-arriving movie might be an expensive bomb. As its anniversary in April nears, the musical with its “year’s best” Tony, thrives; the movie pulls in record grosses and returnees, and the New York Times best seller list shows the photo book by the film’s director, James Cameron, about the making of the film in 10th place among hardbounds and first among paperbacks. Of 30 nonfiction titles, seven deal with the Titanic and two with Leonardo DiCaprio, who plays the film’s fictional hero. Frank Browne, S.J., who boarded at Southampton, was an Irish seminarian in theological studies preparing for ordination. He was an excellent photographer [see AM., 7/6/96]; and, though aboard only two days, he left a notable record of the ship, passengers and crew. Frank’s mother had died the day after his birth, and his father drowned when Frank was in his teens. The father-figure of his teen years was his uncle, Bishop Robert Browne of Cloyne. His uncle treated him to a two-day cruise from Southampton to Cherbourg to Queenstown (Cobh, Ireland), the first voyage of the world’s largest ship. As a first-class traveler, he met a millionaire family who offered him passage all the way to New York. He cabled his Jesuit provincial superior to ask if he could accept the invitation. The terse reply came: “GET OFF THAT SHIP—PROVINCIAL”—probably what he expected. No harm in trying. Frank’s photographic record and more of this story are presented in a new book, The Last Days of the Titanic: Photographs and Mementos of the Tragic Maiden Voyage (Roberts Rinehart Publishers, $24.95), edited by E.E. O’Donnell, S.J., an Irish Jesuit who has now edited 10 books of Browne’s photos. (Frank lived another 48 years and at his death at age 80 left behind 42,000 negatives.) People magazine (3/16, p. 46) uses one. The caption says it was taken by “a student,” but the tiny photo credit gives his name. And isn’t this boy in the new film? The Browne book is fascinating. It reveals how slowly, and erroneously, the facts about the sinking became public. 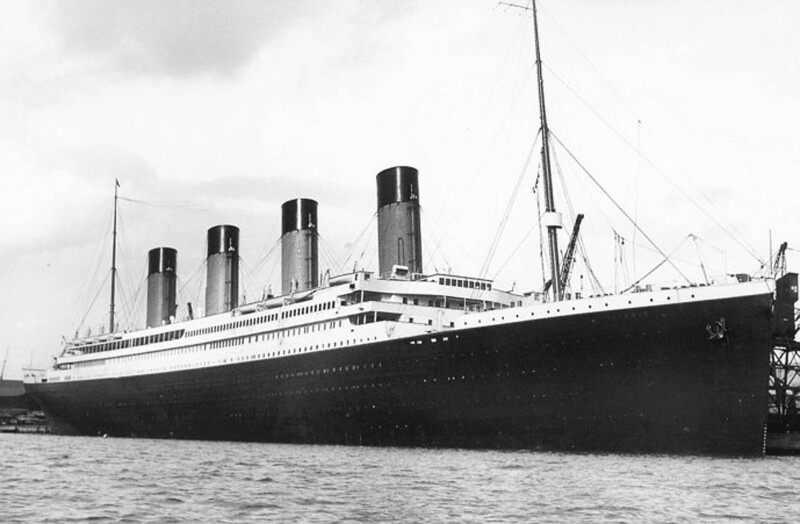 Major newspapers reported in evening editions on the day of the disaster (April 15, 1912), “All the Passengers Saved/ Titanic on Her Way to Halifax.” Next day came news the ship was no more. Then came estimates of the number of deaths. Frank’s photos became very well known right away, and he began lecturing about the Titanic using them as illustrations. To supplement his materials, he made requests of the White Star Line. They replied politely that they would “Appreciate it if in any lectures you deliver, you will abstain from any reference to the loss of the Titanic as you will easily understand that we do not wish the memory of this calamity should be perpetuated.” It didn’t work. Were other clergymen aboard? America ran its first item about the disaster on April 20, 1912. The writer stressed that “officers insisted on women and children first” and reported that there were two priests aboard. In its May 4 edition, official figures for survivors were given: 315 men, 336 women, 52 children. If that sounds like an odd result from “Women and children first,” it helps to know there were 1,662 men aboard, so ⅕ were saved; 439 women, so ¾ were saved, and of 105 children half were saved. On May 18 we read of three priests: Joseph Montvilla (Lithuanian), Thomas Byles (British) and a Father Peruschitz (a Bavarian Benedictine). None had survived. Frank heard from many survivors. The first addressed an envelope to him: “The Rev. Curate Nephew of the Bishop of Diocese who was a passenger from London last week by S.S. ‘Titanic,’ Queenstown, Co. Cork, Ireland.” This was 1912, when postage was a penny. The letter reached him. Uh oh, I hope this isn't the start of a conspiracy theory. There's a large number of trolls in Russia who attribute all historical disasters to the Jesuits. And what does the presence of 4 Catholic clerics on the maiden voyage say of the "No Pope" legend about the Titanic. Edward J. Mattimoe was an editor at America.